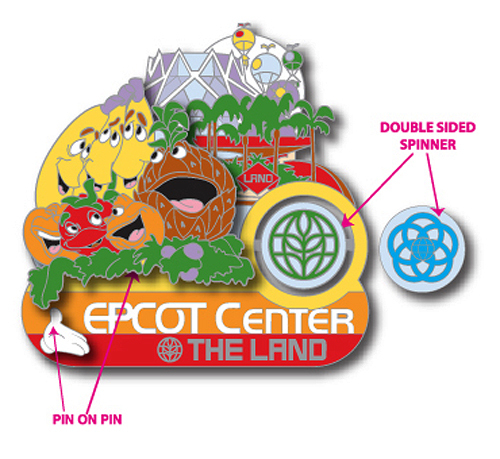 One of my favorite early projects with DDG, was a 5 pin set dedicated to EPCOT Center…actual EPCOT Center, not “Epcot.” This I scored because of fellow intern, Maria Clapsis, bringing my name up in a pin team meeting. I was so so so excited to get this assignment, it doesn’t seem like such a big deal anymore, but back then “retro” was a lot more rare. I pretty much had free reign to go any direction I wanted, and settled on theming each one to a different future world pavillion. The worst part was only have 5 pins to work with. I’m still a little unsure as to whether I made the right choices. I figured I wouldn’t be able to make everyone happy, so I went with attractions that meant the most to me growing up. 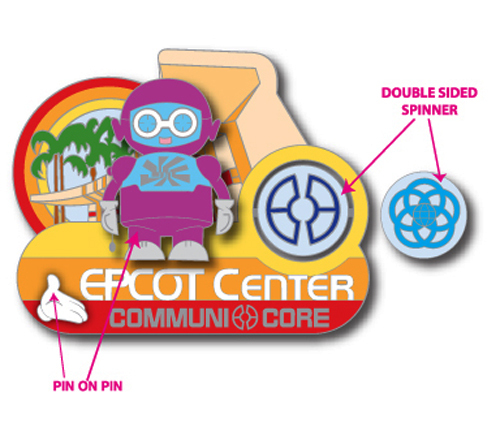 This was a fairly easy decision, hardly any merch for Communicore existed and it had a lot of cool visual possibilities. I went with the somewhat obvious choice of using SMRT-1, and later used him again in my Vinylmation figure. 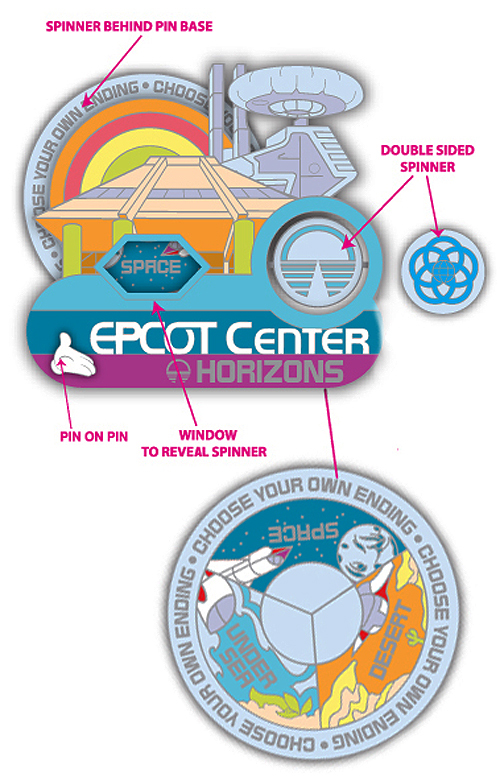 Of course, I had to use my favorite all time attraction, Horizons. This was the most fun and ended up being easily the most popular. My one regret is that I couldn’t fit the actual names of the locations on the “choose your own ending” portion. Sorry Brava Centauri. 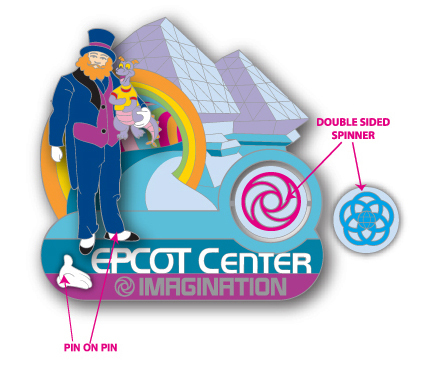 Easy choice, Figment, Dreamfinder, Rainbow Corridor, good stuff. This is an homage to a sweet button from the 80′s. 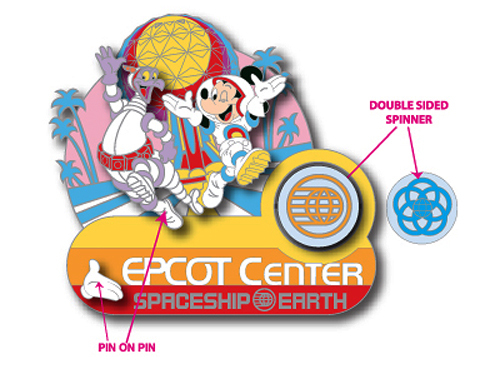 This is the pin I had the hardest time choosing a pavilion for. Originally it was going to be for World of Motion…but honestly I don’t remember WoM that well, and Kitchen Cabaret was a childhood favorite.